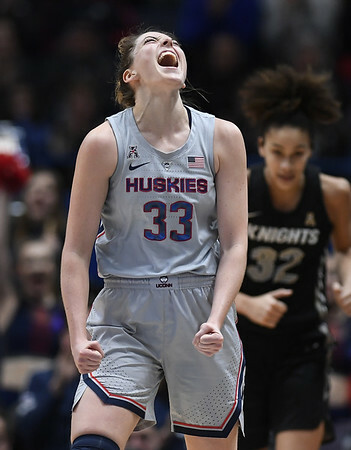 HARTFORD - It’s been a season the UConn women’s basketball team hasn’t seen in a while with the way it has had to grind out a number of its wins. But in what figured to be the toughest grind of their AAC schedule on Sunday, the Huskies were off to the races. UConn scored the first eight points in 85 seconds and never looked back in routing Central Florida 93-57 at the XL Center to take sole possession of first place in the league. UCF entered the game leading the league in scoring defense at 52.7 points per game. The Huskies passed that number in 16:45 on a Napheesa Collier layup and the Knights left the building second in the league in scoring defense. It was 61-36 at halftime on 71.0 percent shooting from the floor and UCF got no closer as UConn scored the first eight points of the third quarter. UConn won the rebounding battle 43-31 and had an 11-4 advantage in second-chance points. The Huskies also got the game to be played at their preferred pace and had a 27-6 bulge in fast-break points. “The game plan for Central Florida is usually to control the tempo of the game with their defense and then control the tempo of the game with their offense,” Auriemma said. “So they do it at both ends of the floor. What is different about them is they are trying to force you to turn it over and get 20 steals per game, but then they don’t hurry up on offense and score 90 like most teams that press like that would want to. That doesn’t fit together. That’s why it is different. Collier paced the Huskies (18-1 overall, 7-0 AAC) with 23 points, nine rebounds, four steals, and three blocked shots. Megan Walker had her second double-double in four games with 21 points and 11 rebounds. Crystal Dangerfield (17 points, nine assists) and Katie Lou Samuelson (15 points, all in the first half) were also in double figures. UConn now leads the AAC in scoring offense and scoring defense. UCF (17-3, 6-1) will get a second shot at UConn on Feb. 17 when the Huskies visit CFE Arena in Orlando. Posted in Newington Town Crier, UConn on Tuesday, 29 January 2019 21:28. Updated: Tuesday, 29 January 2019 21:31.